February 11, 2010 - Vision Systems GmbH - Data communication specialist - announces the new product line of Modbus Gateways named ModGate. These convert the Modbus protocol from network to serial lines. There will be models providing 1 through 8 serial ports controlled via Ethernet. Also available will be devices with an additional Wireless LAN as of 802.11b/g protocols. The Modbus protocol has been invented in the late 70s to communicate with PLC devices. The connection has been established by simple serial links, based on RS232. Today implementations also allow RS485 as physical layer to avoid distance limitations and use multiple devices connected to one serial line simultaneously. The primary Modbus/ASCII transmission mode got the Modbus/RTU as companion, which enhances the data throughput by transmitting the data in direct binary form. Later Modbus got implementations on TCP, to transfer commands and data over networks. VScom ModGate devices connect Modbus on TCP with Modbus on serial lines. They map a target address to a physical connection. The so-called 'Promiscuous Mode' is the most simple configuration. All Modbus messages received from a TCP host are sent to the serial port, and all messages from the serial port are sent to the TCP host. This connects one serial port with one defined TCP host. The 'Mapping Mode' provides use of more flexible configurations. The user defines a list of Modbus addresses assigned to a certain serial port or a TCP host. This list is the mapping table. By inspection of the address field in a received message the ModGate decides which port to sent this message to. ModGate devices with multiple serial ports have independent configurations for the ports. The serial parameters on one port may differ from those of the other ports. First users configure the flavour Modbus/ASCII or RTU to use on the serial line. Then they define the usual parameters as bitrate, parity, stop and data bits. Also the physical configuration as RS232 or RS485 is defined by the configuration software. There is no need to open the case or set the DIP switches for decisions like that. The mapping table specifies target Modbus lines a received message will be sent to. Messages received from a serial port typically have a target defined as a TCP host. If the connection is not already established when the message arrives, ModGate contacts the host. Such a host can be another ModGate, which will forward the message to one of his serial ports. This function allows to connect several serial Modbus lines in different locations. On a ModGate with multiple serial ports the target may be another serial port. The ModGate will then forward messages between those serial ports. Since the serial parameters may differ from each other, ModGate will act as a protocol translator. 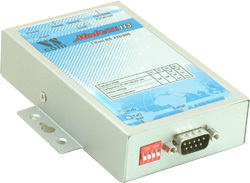 For example one RS485 line using Modbus/RTU at 115200bps can connect to a RS232 line with Modbus/ASCII at 9600bps. Most network functions in ModGate devices are based on TCP. The protocol Modbus/TCP is defined to use TCP. The configuration software is available via HTTP, i.e. in the web browser. This also uses TCP to make the connection. TCP/IP is the base protocol suite which makes the Internet work. As the consequence Modbus devices not only operate in Intranets, they also work via the Internet. Customers install and configure the Routers to connect the ModGate devices to the Internet. For configuration users need to know the IP address used by the ModGate. The ModGate use UPnP functions to announce their presence in a LAN. So on Windows they appear in the Network Places, where it is simple to connect the browser to the ModGate. UPnP uses Multicast protocol formats, these are typically blocked by Routers. Ethernet is the primary network type available in all ModGate devices, which connects to the LAN. If the LAN is connected to Internet, ModGate is available worldwide. The models providing additional WLAN (802.11b/g) use a second way connecting to Intranet/Internet, ModGate can operate both interfaces at the same time. With WLAN they support mobile operation.